Who doesn’t love a great waterfall? While some are hidden away miles into the woods, many local falls are only a short walk from the road. If you’re itching to cool off from the summer heat, these short-hike spots, all under three miles, should be at the top of your list! The power of the water is evident and impressive on the polished by nature granite pot hole. If you are heading into the White Mountains on Interstate 93, you will see signs in Lincoln for The Basin. Once there, you can pull into the large parking lot and head a mere 0.1 miles on a paved trail to The Basin, a circular cave ­line formation created by the falls’ rushing water eroding the rock over thousands of years. Ease of access means you will not be alone here, but this is a stop not to be missed. 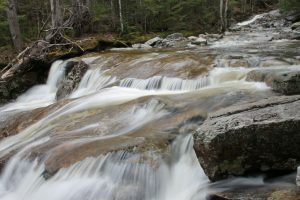 When you are ready to get away from the crowds, continue on the Basin­ Cascade Trail for a half mile to arrive at Kinsman Falls, where the sounds of cars have faded. For even more solitude, go another half mile on the root-filled trail to Rocky Glen Falls. This quiet beauty only requires a two-mile, round-trip hike. Silver Cascade is visible right from U.S. Route 302 and has parking across the street. To get there, just cross the road and make a short walk up to the falls to admire its 300-foot drop. 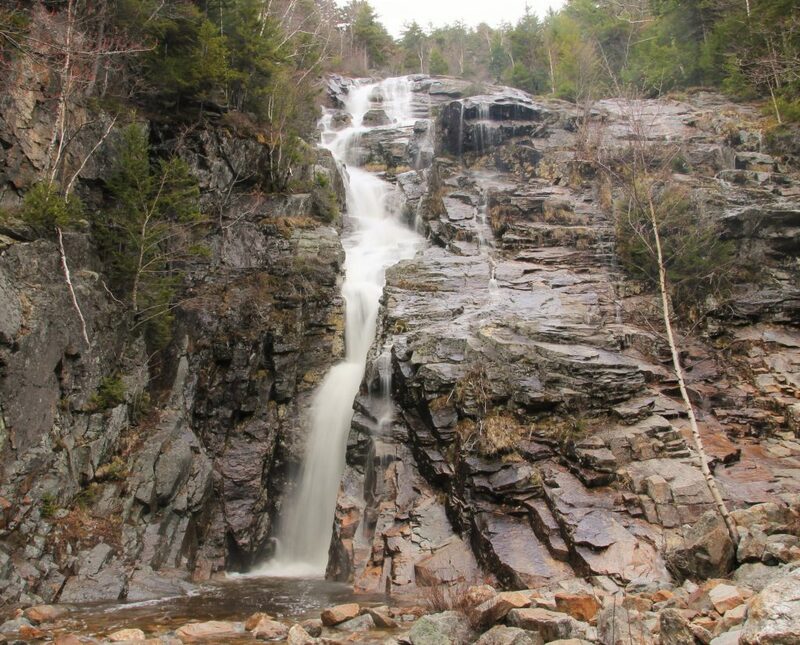 Moments away on Route 302 is Flume Cascade, another waterfall with a 300-foot drop that’s just a short walk across the street from the parking lot. Like the Silver Cascade, the Flume Cascade should not be missed! When you are ready for a walk into the woods, head further along Route 302 to the trail head for Ripley Falls. A steep, rocky trail gets you there in about half a mile. The 100-foot falls, while not as high as many others in the area, are still impressive, with the angle and the ability to get close adding to the overall excitement. This popular hike, which leads to Mt. 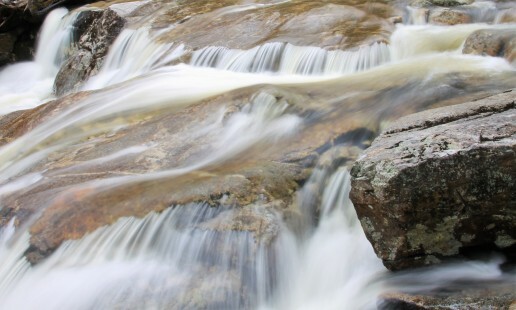 Lincoln, has four incredible waterfalls, all within the first 1.5 miles! 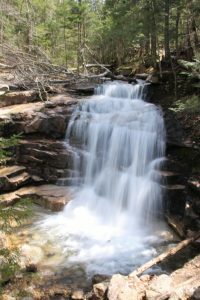 The first mile of trail, nearly flat and easy to walk, brings you to Walker Cascade, which can be challenging to locate, as it’s just a series of cascades. Stairs Falls, the next during your hike, is best viewed slightly off the trail; for just a few extra steps, we feel it is well worth it. A short walk further brings you to Swiftwater Falls, at 0.9 miles from the parking lot. The trail crosses the stream here, making it a great spot to linger on a hot day, as the water is usually well under knee level! Finally, the grand finale is Cloudland Falls, with an 80-foot drop. For many, this is the stopping point, but if you are continuing your hike, it is a wonderful snack spot. The mist of the waterfall is a natural air conditioner, and the falls are mesmerizing to watch. If you are a winter hiker, this waterfall is also spectacular when frozen over! If you only have a couple of hours to explore, you can fit in one or two of these waterfalls for an adventure. Have the day and want to get some exercise? Why not see them all! 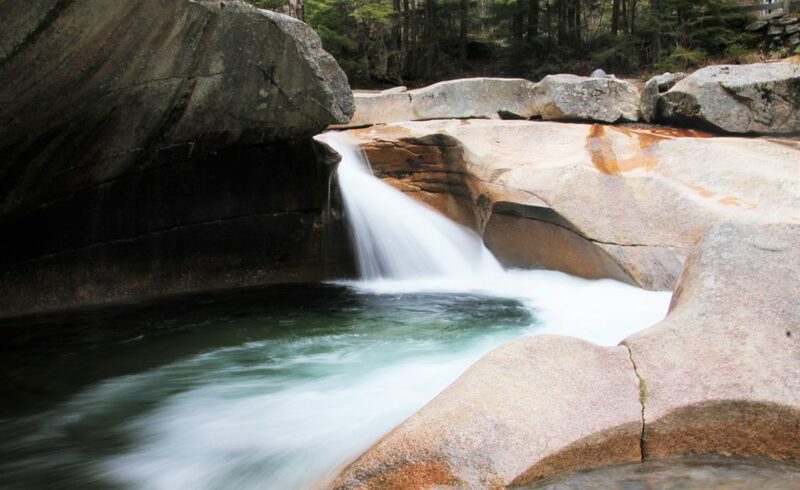 So, bring a towel and picnic lunch to enjoy the beauty of some of the best waterfalls in New Hampshire. Let us know if your favorite made the list, or if you have another we may not have heard of! Heading into New Hampshire’s White Mountains, the highway winds between Cannon Mountain and Franconia Ridge. On most good weather weekends from May until October, cars line in each direction. Some may drive by, wondering about the traffic, but in the hiking community, it is no secret. 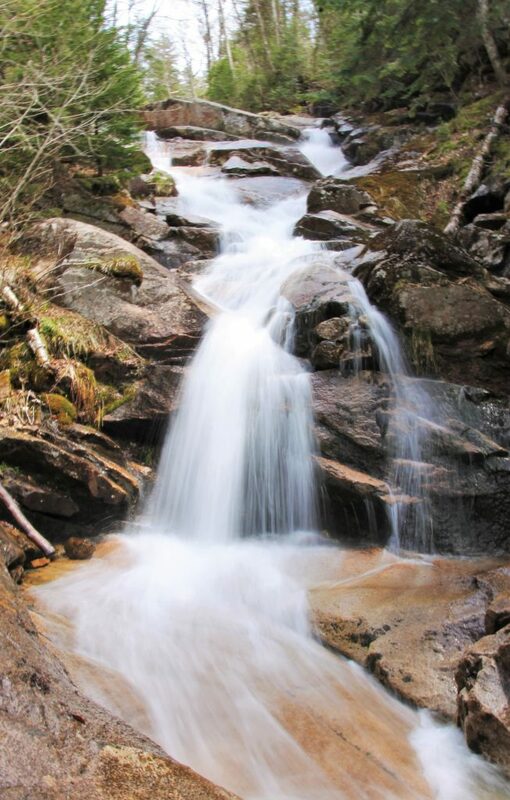 The people are there to experience one of the most scenic spots in the White Mountains: the Falling Waters Trail, or Franconia Ridge hike. The Granite State boasts many great spots, with hundreds of trails, yet this one remains a favorite. There many reasons this route should not be missed. The first is easy trailhead access. Unlike other spots in the White Mountains, this one requires no complicated directions, as it sits right off Interstate 93. The hike is also a loop. The convenience of beginning and ending in the same parking lot means you will not need to arrange for a pickup, leave a car at the end of the trail, or hike all the way back. 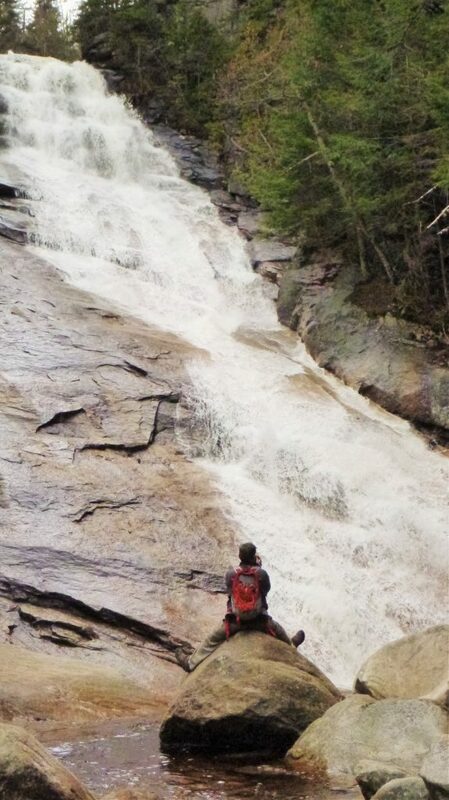 Of course, the endless waterfalls along the trail are another top reason. Visually, the scenery is a paradise that will bring out the photographer in anyone. The loop is 8.9 miles and gains 3,900 feet of elevation. 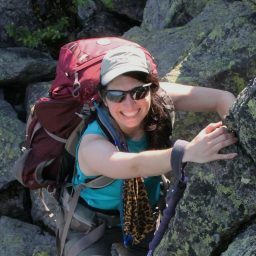 The Appalachian Mountain Club lists the average time of completion at seven hours, and further labels it a strenuous hike. As such, do not be fooled by the numerous hikers, trail runners, and even dogs taking the same journey: This is no easy ascent. If you are not accustomed to being active for seven or more hours, I’d recommend a shorter version. Head up the Falling Waters Trail to avoid going down slippery steep rocks and doing river crossings when tired. Alternatively, some like putting their feet in the many falls on the way down. Without much elevation gain, the trail’s first mile has numerous waterfalls for photos or taking a brief break. If at the 1 mile mark you feel like hiking some more, continue on another half mile to Cloudland Falls, the trail’s most spectacular waterfall. While the route becomes steeper and there are some rocky sections, the waterfall is worth the effort. This is a great spot to stop, relax for a moment, and take some photos. Breaking out of the trees to the ridge, the natural wonders will continually stop you in your tracks, as Cannon, the Kinsmans, and Lonesome Lake are behind you during your ascent. 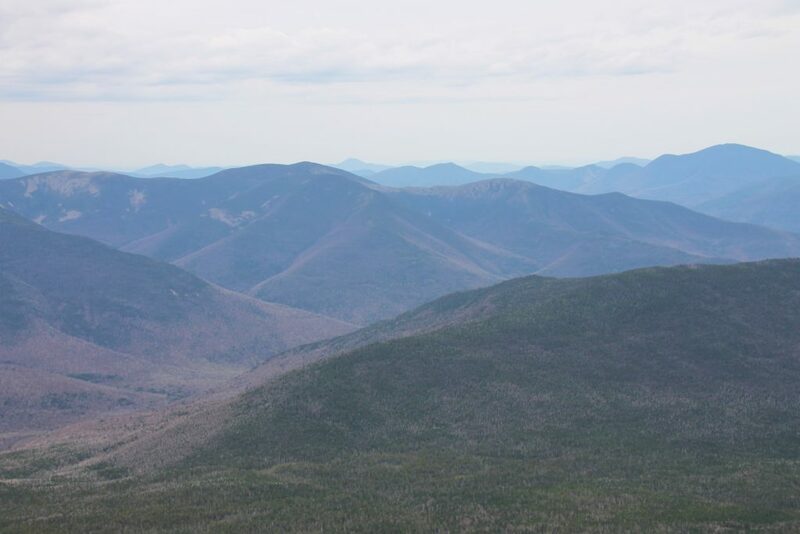 On the ridge, you are treated to breathtaking sights of the vast Pemigewasset Wilderness. There, you will see gorgeous forests without a single road or building to spoil the spectacular view. It is the perfect location to stop and drink in the scenery of rolling mountains and greenery. From Little Haystack Mountain, Lincoln doesn’t look too far on the ridge, at only 0.7 miles away. Walking along the rock path, you feel on top of the world. While it’s not very narrow, the dropoffs at both sides of the trail can make some nervous. However, this stretch goes by quickly, as views in every direction keep hikers distracted. Mt. Lincoln is 5,089 feet and the first on this hike that counts for New Hampshire’s 4,000-footer list. On Lincoln, you can look back to see hikers on Little Haystack and glance ahead to Mt. Lafayette further up the trail. For a hiker, seeing from where you have come and just how far you have to go can be extremely gratifying. The trail from Lincoln to Lafayette gets rockier, with some larger boulders and sections that are best described as “scrambles.” The patches of moss and majestic landscape give this part of the route a Lord of the Rings feel. Dropping down from Lincoln is a short­-lived break before you make the climb up Mt. Lafayette. This section between the mountains is only .9 miles, yet can sap your energy, even though you’ve already traveled four miles. On this 5,260-foot summit, you might as well say it’s all downhill from here! 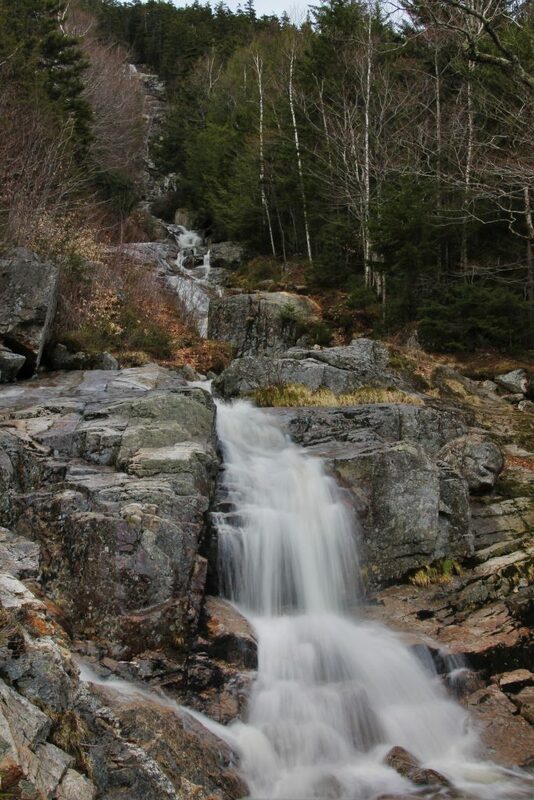 Enjoy more stunning views of the Pemigewasset Wilderness and Mt. Washington, when it isn’t in the clouds. Many hikers stop to have lunch here, as the climbing is over and refueling for the trip down is crucial. 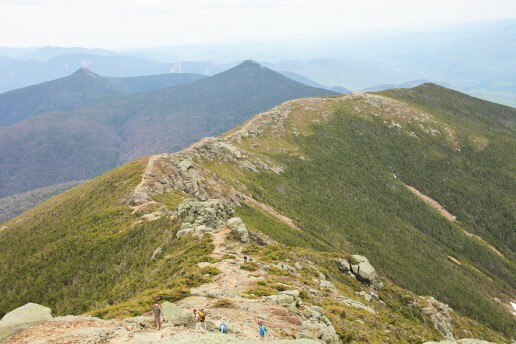 The Appalachian Mountain Club’s Greenleaf Hut is 1.1 miles down the trail. If it’s open, stop in to refill water or buy some amazing homemade baked goods. You’ll soon find the descending route is steep and rocky, as it is mostly exposed, with only a small section in the woods very close to the hut. The trip from the hut to the parking lot is 2.9 miles. While Old Bridle Path is not as steep overall as Falling Waters, there are many sections that will test your joints. The Hut Crew named these “The Agonies,” and I cannot imagine carrying supplies up this route to the hut! So, take time to rest those sore muscles and joints on the way down at the beautiful ledges that offer great views. Here, looking back to see the ridge you just hiked is quite incredible. At the final .2 miles, this route meets the Falling Waters Trail again, and in moments, you’ll be back at your car. 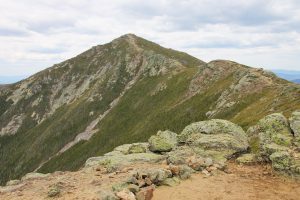 Incredible sights and an amazing above-treeline ridgeline put this Franconia Ridge loop on endless best-hike lists nationwide. Even with the crowds, its beauty cannot be denied. To explore, pick which option is right for you, and enjoy this quintessential New Hampshire trail!